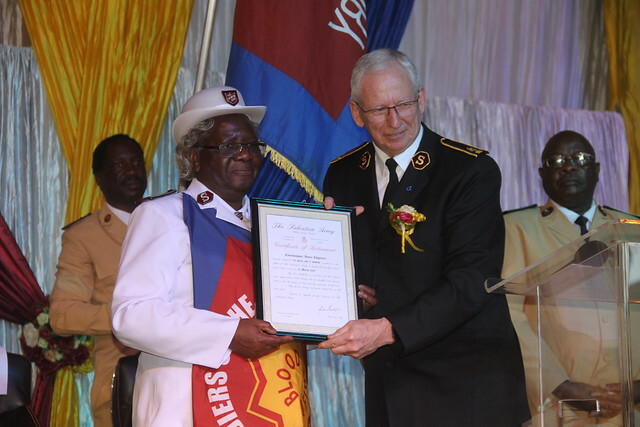 LEADING the retirement meeting for Commissioner Vinece Chigariro, General Brian Peddle challenged Salvationists from the Zimbabwe and Botswana Territory to be people of prayer and holiness – attributes that were demonstrated in the life of the commissioner. ‘We should all be ready to be a people of prayer, a people of holiness and holy living,’ he said, ‘to be a people who will take up the battle for Jesus Christ!’ Commissioner Chigariro entered retirement on 31 March 2019, having served for 43 years and seven months. At the time of her retirement she was the international Salvation Army’s ‘senior commissioner’ – the officer to have served longest as a commissioner. Having presented the commissioner with her retirement certificate, the General called on the congregation to be faithful to God who will in turn, he assured them, be faithful. He encouraged all listening to learn from Commissioner Chigariro’s faithfulness to God. He offered a thanksgiving prayer to God for the service of Commissioner Chigariro as she knelt at the mercy seat. In her retirement message, Commissioner Chigariro thanked God for his faithfulness and protection over many years of service. She attributed her success and resilience in ministry to prayer, and encouraged serving officers to press on despite the challenges they will face. She assured the congregation that ‘I have trusted my God in everything’. Various speakers commended Commissioner Chigariro for visionary leadership and the desire to see the Army grow.